William Ballinger was recorded by his grandson Brian Ballinger in 1957 when he sang Banks of Sweet Dundee, Barbara Allan, Box on her Head, Brennan on the Moor, Cold Blows the Wind, Dark Eyed Sailor, Jim the Carter’s Lad, Jolly Waggoner, My Wife She’s a Good Old Cratur, Northamptonshire Poacher, Raggle Taggle Gipsies, Ship That Never Returned and What’s the Life of a Man. William Henry Ballinger’s family were from Hardwicke. His grandfather, Josiah Ballinger was born about 1814, the son of Sarah Ballinger. His birthplace is given in the 1851 census as Badgington (possibly Bagendon) and in the 1861 census as Boddington. He married Hannah Dainty, a labourer’s daughter, on 9 September 1838 in Hardwicke where he was working as a labourer. On the marriage certificate in the place where the father’s name is usually recorded his mother’s name appears. Research into Josiah’s background by Stuart Ballinger in 2010 shows the following: his mother was Sarah Ballinger (b1793 in Shalbourne, Wilts). However, Sarah married a Samuel Waters in Shalbourne where they lived and had five children. But in 1814 she gave birth to Josiah in Bagendon, Glos. After the birth Sarah returned to Samuel and had a further three children. It is not clear what happened to Josiah in the meantime but the records show that he turns up in Hardwicke, Glos in 1838, where he married Hannah Dainty. 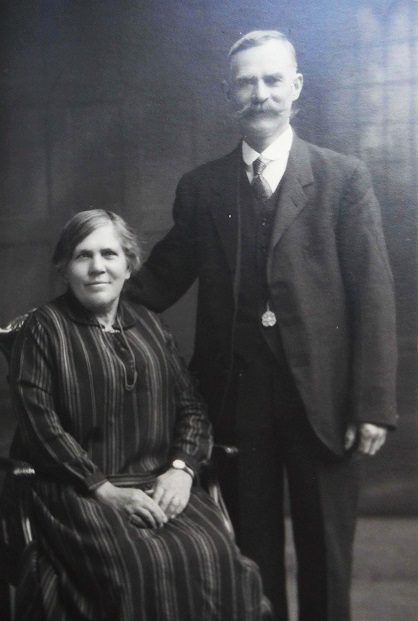 In 1841 Josiah and Hannah were living in Hardwick, where Josiah was working as a labourer, with their daughter, Harriet, born on 1 September 1839 in Hardwicke and Jane Dainty aged 5 whom was baptised on 27 November 1836 while Hannah was unmarried. Jane later took the surname Ballinger. By 1851 Josiah and Hannah were living in Bristol Road, Hardwicke where Josiah was working as a carter, by which time they had another four children all born in Hardwick, Sarah Ann baptised 7 May 1843, William born 8 December 1845 , Henry baptised18 July 1848 (William Henry’s father) and Ann born 13 February 1851(died aged 1 and was buried on 19 February 1852). Another child, George, had died 3 days after his birth on 15 January 1842. By 1861 the family were living at Hamlett Cottages, Hardwicke where Josiah was working as an agricultural labourer. Of the children Harriett and Henry were still living at home. Henry was working as a carter’s boy and Josiah and Hannah had three further children all born in Hardwicke, Thomas born 20 December 1852, Eliza born 25 October 1855 and Charlotte born 20 August 1858. Josiah Ballinger died and was buried in Hardwick on 12July 1863. By the beginning of 1871 his widow, Hannah, was living at Hardwick Court with her children, Henry, who was working as an agricultural labourer, and Charlotte. Henry Ballinger, William Henry Ballinger’s father, married Charlotte Collins of Elmore, the daughter of a labourer, on 10 April 1871 in Hardwick. Their son, William Henry Ballinger, was born on 19 December 1876 in Hardwick. By 1881 they were still living in Hardwick where Henry was working as an agricultural labourer. As well as William Henry they had another four children, Annie Maria born about 1872, Alice Mary born 22 January 1874, Albert born about 1879 and Emma Matilda baptised 3 October 1880. Whilst living at Hardwicke Henry became a farm bailiff. Between 1883 and 1885 the family moved to Red House Farm, Deerhurst Walton where Henry was working as a carter. By 1991 they had another two sons, Ernest Alfred baptised 18 February 1883 and Thomas George baptised 11 January 1885, and Henry and his sons William and Charles were all working as farm servants. William Henry Ballinger married Kate Robbins, the daughter of a carter, on 23 March 1897. At the time William Henry was living at High Road, Deerhurst and Kate was living in Deerhurst Walton. By 1901 they had moved to Knightsbridge, Boddington, where William Henry was working as a corn miller’s labourer. On 2 February 1902, while they were living in Deerhurst Walton, William and Kate had a daughter, Edith Annie, and then on 5 May 1907 they had a son, Alfred William Ballinger. By 1911 William Henry and Kate with their two children had moved to Whitefield Cottages, Apperley where William Henry was again working as a carter. He worked in farming in Deerhurst and Apperley but after his war service in 1914-18 he worked as a builder in Gloucester. William Henry Ballinger died on 8 December 1958 whilst living at 42 Sapperton Road, Gloucester when probate was given to his son, Alfred William Ballinger, a civil servant.